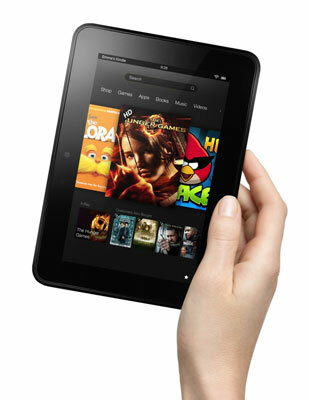 Kindle Fire HD, the second generation of Kindle Fire, is lighter and smaller than iPad, at 7.6 x 5.4 x 0.4 inches and weighing only 13.9 ounces, versus iPad’s 9.7-inch display and 1.3-pound frame. For some, that smaller, lighter form factor makes the Kindle Fire HD easier to hold with one hand than the iPad. In addition, the rubberized back helps you keep a tight grip on the device, in most circumstances. A tablet is a handheld computer with a touchscreen and an onscreen keyboard for providing input, and apps that allow you to play games, read e-books, check e-mail, browse the web, watch movies and buy music, and more. Kindle Fire HD has a projected battery life of 11 hours. The screen resolution on the Kindle Fire HD’s bright color screen is just about on a par with the best tablets out there, and it brings the addition of gorilla glass, which means the screen is tough and probably doesn’t require an additional screen protector. In its first generation model, Kindle Fire had no camera or microphone, which meant you couldn’t use it to take pictures or make phone calls. With the arrival of Kindle Fire HD, you have a camera and microphone that allow you to make video calls with the built-in Skype app. However, there still isn’t what you’d think of a traditional camera, one that allows you to take still photos or videos, as you can with some other popular tablets. Finally, though a Micro USB cable (one end is a standard USB connector that fits in your computer and the other end is a micro USB connector that fits into Kindle Fire HD) is included with the Kindle Fire HD, there’s no power adapter for plugging it into an outlet and charging it. You can buy an adapter from Amazon for about $10 when you buy your device or $20 if you buy it separately. Alternately, you can root around in your kitchen drawer to see if you have ever owned a smartphone that came with such an adapter. The adapter simply plugs into the USB end of the Micro USB cable. The following table provides an at-a-glance view of Kindle Fire HD features.